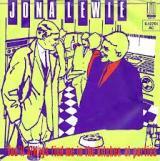 In 1980, Jona Lewie hit the chart with the humorous song You’ll Always Find Me in the Kitchen at Parties, but it wasn’t his first chart appearance. Jona had been in the business some 17 years by then, so how hardly anyone noticed? In 1968 he embarked on a solo career, but the following year he was invited to join the already popular Brett Martin and the Thunderbolts. Unusual choice so soon after launching a solo career, John explained the reason, “When Graham, the leader, invited me to join the band in September 1969, I was still doing solo gigs as John Lewis as a blues singer but it was a good time in my life to join a band again because I was in my third year at college studying for a Degree and the solo gigs I was doing were becoming demanding because of my studies, whereas playing in a band was almost by definition not demanding on one’s nerves at all and actually enjoyable. Funnily enough for the first year with the Bretts I was the pianist only, mainly because of my studies, and I didn’t become one of the lead vocalists until about a year after I had joined. On the day I left college in June 1970 the band officially became professional where all the members of the band were agreed on doing more gigs. He signed to Sonet records and released a string of singles that all flopped, then in 1977 he signed to Stiff records and joined the package tours. He released four singles, The Baby, She’s On the Street and Hallelujah Europa in 1978 and God Bless Whoever Made You in 1979, all of which failed to excite the public. Then in 1980, he scored his first solo hit. After Kitchen peaked at number 16, he followed it up with the Christmas ditty Stop the Cavalry which became his biggest hit reaching number three. In the download-era, most of the big Christmas songs re-appear every year for about three weeks and then disappear again, Stop the Cavalry has only appeared once in 2007 when he skidded to a halt at number 48. In 2009, Lewie appeared at the London Ukulele Festival where he performed a couple of songs and the following year toured with both the Glitter Band and Captain Sensible. In 2010, IKEA used the track to advertise their kitchen range. The video for the TV ad featured Johnny Langer and Peter Duffy, known as Man Like Me, at a party and wandering around a house that was made up of only kitchens singing a version of the song which had been remixed by Arthur Baker. If you look at the ad carefully you’ll notice that the party’s host was none other than Jona himself.